two of you….and best of all, in a non-threatening, fun, and relaxed environment. Saturday morning from 8:30-9 am donuts and coffee will be provided free of charge. Saturday lunch is included in the registration fee. In advance, in person. In advance, by mail. At the door on Friday of conference. If mailing a check, please mail to Bethel Baptist Church, 2907 N. Walton Blvd., Bentonville, AR 72712. ​Make check payable to Bethel Baptist Church. 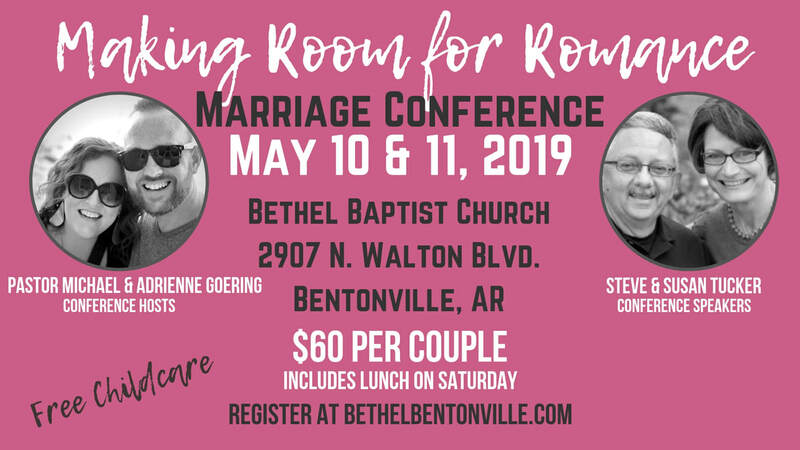 If mailing a check, please mail to Bethel Baptist Church, 2907 N. Walton Blvd., Bentonville, AR 72712. ​Make check payable to Bethel Baptist Church.